Another day of vacation and another ride! I woke this morning around 5:30 am. Surprisingly late since I passed out before 8 pm the night before. Two reasons for the early bed time. One, being exhaustion of course. The other was I simply could not sit. Irritatingly, my tailbone has been bothering me with increasing intensity. Cycling is likely part of the problem, but not something I’m willing to set aside. Can’t really walk for exercise and now supposed to stop cycling because of my rump? What does that leave? Swimming laps in the pool? My sanity would be the next casualty. So, after yesterday’s ride and then toodling around in the car with Jens in the search for fishing spots, chairs and I became enemies. So, I flopped onto the bed, intending to finish pre-writing the blog post of the day’s ride and… that’s all I remembered until opening my eyes at 5:30. Unsurprisingly, the skies were a pale lead hue and the car water-speckled as the forecasted rain arrived. I admit waffling about riding or not though I’d looked forward to what I’d planned for our second day here. For the last two rides, I’d hoped to ride the Sverigeleden from Hogfors to as far south toward Karlstad I could. 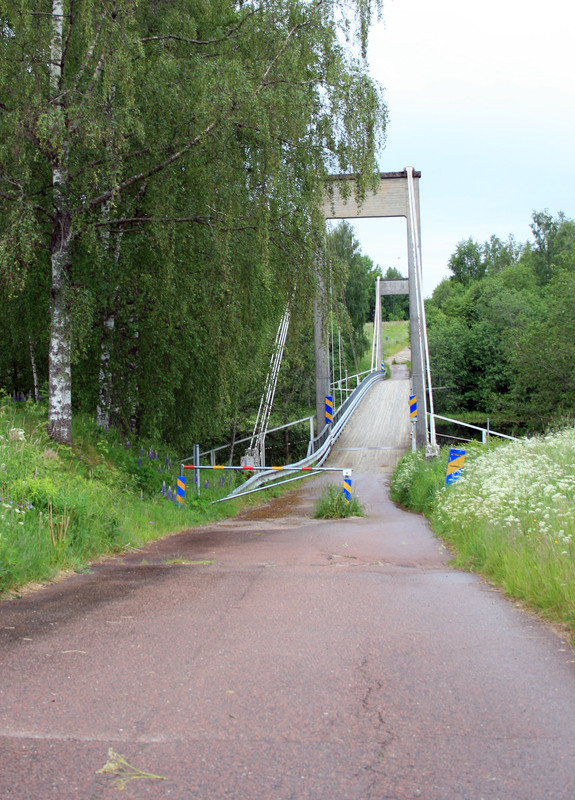 In Hogfors the Sverigeleden joins a cycling path called Klarälvsbanan named after the Klarälv River it mostly follows. The full length of the Klarälvsleden runs from the town of Sysslebäck all the way down to Karlstad at the northern shore of a huge lake. Between Sysslebäck and Hogfors, the path is marked on roads. I rode about 10 miles of it as I came south on the eastern bank of the river to Eksharad. Until today, I had no idea the Sverigeleden and Klarälvsleden joined for that distance. The main thing exciting me about the stretch between Hogfors and Karlstad is it is almost exclusively a purpose made, paved bike and pedestrian road. No cars permitted. The thought of no worries about traffic made me nearly giddy. So, I got Jens awake and we started moving around 7:30 or so. It turned rather stressful though. As we were loading the car, the chain jostled off the chain rings to the inside against the boom. When that happens, it ends up wedged with nothing short of a miracle freeing it without removing the right crank and rings. That of course requires a chainring wrench. A quick glance at the front small pocket of my red panniers told me it wasn’t there. My stress levels jumped. Attempting to remove the crank without the tool might damage it requiring a new one. A 155 mm crank with a five spokes for a road chain set which is out of production and nearly impossible to find 3 or 4 years ago. I imagine it would be even harder now. Not removing it would mean a stuck chain equaling no more rides for the duration of our time here. Jens remained calm and the voice of reason. He decided we’d drive to where I planned to begin so we could unload the trike where I’d have enough room to check all the pannier bags for the tool. If I didn’t have it, we’d go sightseeing. I was convinced it would be better if we spared him the time away from fishing. He talked me around. It rained off and on during the drive. As we unloaded the everything pinning the trike in the car, it drizzled. After a few moments, Jens lifted the trike down and I jumped forward to dig through the panniers. It wasn’t in the proper bag, but as I reached into one of the bigger pockets, I felt the case and pulled it out with a sense of relief. After all the stress, Jens seemed caught off-guard when less than 3 minutes later, I had the chain back on the rings and purring through the tubes like a kitten. It’s amazing what can happen when one has the proper tools. I carefully put them away in their proper place so future panics can hopefully be averted. I took pictures of Hogfors church before settling into the seat. My very supportive hubby said he’d wait around town for an hour or so to be sure Loke was going to hold up before he left for the fishing spot he’d decided on the day before. I took a wrong turn right off, probably lulled by the more attractive stretch of cycle path running between trees an a canal rather than the bridge over the canal to the backside of a large grocery. Once he had a smooth stretch of pavement before him, Loke was prepared to strangle himself on the harness if I didn’t let him run. So, I let him have a half mile sprint to make him more manageable to turn back. AIt was a good thing I let Loke have that brief run. The area behind the shopping center was as cratered as the moon. Rolling through there at 15 to 20 mph would have destroyed the trike and likely Loke and me with it. As it was, I hit a couple gaping canyons where I stopped to check for flats. As I bounced and swerved to avoid the worst pits, surrounded by the reek of dumpsters, I had time to reflect on how often riding in an urban area is unpleasant. I can’t remember ever enjoying a ride through anything remotely the size of a town or city population center. Uppsala I at least know well enough to avoid the worst roads so I didn’t mind it so much when I went to the cathedral for the runestones. The later hills through the town weren’t nearly so steep as that first one and all of them were decently short, 200 to 400 meters. During the ups and down through a suburbia looking area, I spotted the Sverigeleden sign. That little bit of green and white colored metal was a comfort. I did have a worried moment as I followed GPS and map toward the bridge. The signs indicated a dead-end rather than a street that changes into a cycle path. Fortunately, the maps were right and after passing through a barrier, I rolled out over the river on an old suspension bridge. The view was beautiful, but I’ve decided bridges shouldn’t make the kind of noises that one did. Creaks, groans and pings. The pinging sound bothered me most. It gave me images of the metal fibers of the suspension cables snapping. I was quite happy to make it to solid ground on the far side even if the path was gravel and steep. My drive tire had trouble getting a grip so for every 10 feet covered I probably pedaled the equivalent of 15 feet or more. The path joined a dirt road and lacked any perceivable Sverigeleden sign. I pulled out my maps to compare with the GPS. Loke sat down and gave deep sighs as if to say, ‘Hurry UP!’ He even nudged me a few times before sighing again. I’d mapped north so north I went. I kept our pace slow on that road, attempting to keep Loke on the smooth sections as he remained barefoot. Though the rain had stopped less than a mile from the Hogfors church, the ground remained quite wet. The socks last less than 3 miles without duck tape reinforcement and I had a minimal supply, so had to hope the ground dried at least long enough for the tape’s adhesive to set before putting them on the furball. We bounced along through dim green of a densely forested road with quite a few pot holes and zipped down a hill toward the turn onto what I thought would be the cycle path. Wrong. At the base of the hill was an old rail bed. Apparently, cycle path joined it later because where I sat, the tracks remained in place. It was quite pretty though. Trees hugging close and arching over the metal lines and ties in a tunnel of green, vibrant even in the dull light. It might have been yet a 3rd part of the Klarälvleden. There’s part from Sysslebäck to Hagfors routed on roads, then there’s the Klarälvsbanan which was what I was looking for. It also seems there’s a leg or perhaps a side-spur of it people can ride the old rails on specially designed bikes. One person can pedal the rail bike which has a small truck section on the back or side where you can take a picnic lunch and passenger. 2 if they’re small. A neat concept, but it did me no good. It had barely sunk in before the assault began. Mosquitos descended on us in untold numbers. I didn’t take pictures of the pretty view of the old tracks because I was desperate to escape. I’m not sure the photos would have showed anything other than a dense cloud of flying bloodsuckers even if I’d stuck around long enough to dig the camera out. They drove Loke crazy too. He was snapping at them, sneezing and rubbing his face with a paw. We fairly flew back up that hill which thankfully was not as steep as the first one of the day. So, we took the south way and quickly found a Sverigeleden sign. The road had some beautiful patches of scenery and wide strips of smoothly packed ground for Loke, both of which let me start to enjoy the ride. I did come to small dilemma at one intersection. The Sverigeleden went one way, but signs pointed in the opposite way for a cafe, but more interestingly, a cultural location which could be anything from a castle to a farm stead or ruins. Annoyingly, it didn’t say WHAT or HOW FAR. I must have stared at it for a minute before I decided to stick to the path. If I’d been on tour rather than a day ride with limited time, I might have risked adding another 5 or 10 miles. Perhaps I should view it as an excuse to make the Klarälv stretch into a full blown tour in the future? If so, I really need to reexamine the trike’s gearing. As much trouble as I had relatively unloaded, I would hate to be struggling to pull camping gear up these hills. Not to mention, I need to actually start touring! Reluctantly, I obeyed the little green sign. The colors on this trip have been amazing. Not just during the cycling. Even on the drive up here there have been flowers all over. The most promenient have been the lupins. Stalks which can be 2 feet or more long with small blossoms dense along their length. Deep purple are the most common, then various shades of pink with white most rare. Around Uppsala they grow in small clusters of perhaps 20 stalks. I’ve seen long patches of nothing but purple and pink for 100 or 200 yards since we came to the west side of Västerås. I found another another glorious burst of color with not only the lupins. Just beyond the vivid wall of purple and pink a carpet of vivid yellow spread across a field. 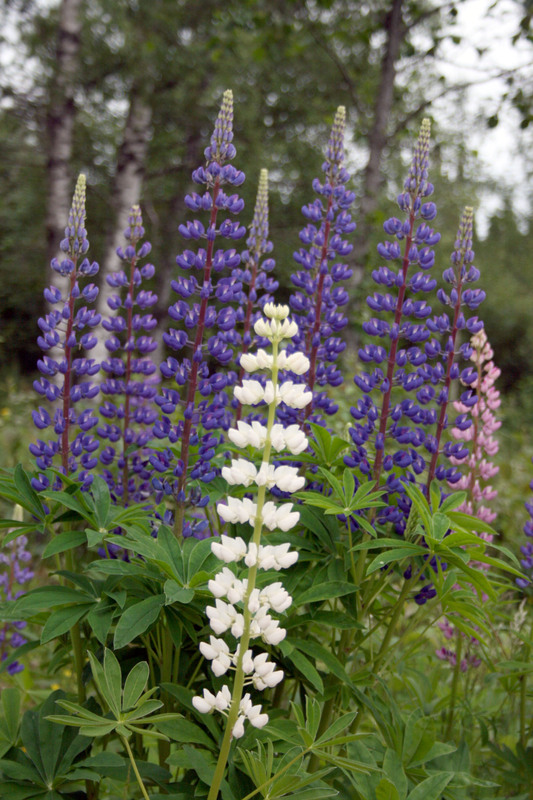 A friend I reconnected with thanks to Facebook is the one who told me the name of the lupins which grows in his garden over the ocean. Every time I see them now, I think of him. This scene I just had to share with him. As I took an iPhone picture and began making the post to his wall, I heard a whinny and the thud of hooves. A horse galloped through the yellow flowers toward us. She was intensely curious and something about how she came up as close as she dared with the electric fence reminded me of the very friendly cat the day before. She wanted to come greet us and, unlike the cat, had no fear of the fuzzy one. Loke was fascinated with her and not in the ‘Can I eat it?’ way. I don’t think at least. As we rode off, she whinnied after us. I breathed a little easier with asphalt under Loke’s paws. Smooth asphalt with plenty of bitumen filling the gaps between rocks so much less risk of stone bruises which has been the bigger problem of late. The sign for Uddeholm appeared and the Sverigeleden signs continued to lead us through residential streets. I barely needed the maps I’d printed though they’d be necessary when I went off the route in search of churches and such. Finally the street ended at the 62 and I saw the large welcoming sign for the Klarälvsbanan. Of course, I had to stop for a picture of it. Loke actually whined and pranced as I put the camera away. I’m not sure why. Maybe he was catching my excitement. No cars for 50 miles or more, except when I went to look for churches and the like. I didn’t expect much in the way of hills either since rail roads tend to avoid those. I was nearly giddy. The shoes clicked into the pedals and we were off like a shot. Loke ran. Not a full out 20 mph charge, but an enduring lope of 12 to 14 mph. 2 miles or more passed and still he ran, tongue flopping in that husky grin, ears up and giving me little side looks from time to time. I stopped him once to offer water, but he just tried to pull us onward. I managed to to get one picture taken during the stretch, but only thanks to my repaired brakes or he’d have kept us going. I didn’t stop him except for the lake picture where I offered him water. I can’t remember the last time he ran for so long a stretch. Maybe on Öland last year as we approached the castle ruin. One reason he doesn’t get the chance to lope for miles is due to me and hills. Not many spots are so flat around Uppsala. The trike wheels sang against pavement as smooth as newly laid asphalt, wet in most places with the past rain. The main road, the 62, vanished behind a wall of green and birds added their voices to the trike’s and the gentle squeak of the spring in Loke’s running bar. To the left, the trees occasionally parted to tease me with glimpses of a lake with waters faintly rippled like medieval window glass. I smiled with a sense of peace with all in the world. For so stressful a beginning, it was turning into a perfect day, gray skies and all. As we rounded the northern tip of the lake and turned south, small patches of blue appeared briefly through rents in the cloud cover. I had mixed feelings about the possibility of sunshine. Yes, it would improve the colors of photos, really making the flowers pop, but for a husky running in June, clouds are better. At least the day continued to have a crisp quality to it instead getting muggy hot. Compared to last year this summer has been on the cool side if wet. I’m loving it though most Swedes are pining for the melting temps of 2011. The lake view disappeared as I briefly joined a small road with an annoyingly steep, but brief hill. It was around 9:45 am and I passed the first of fellow travelers on the Klarälvsbanan. An older man and a young girl pedaling along on touring bikes who greeted with smiles. A return to the bike exclusive roadway carried me through a corridor of green with pines and ferns to either side. The morning air was rich with the smell of wet forest which I find pleasant. The clouds were thinning when I could see the lake again. As I turned my attention to looking for a way off the path and across the 62, a bathroom symbol appeared on my Garmin screen. The timing was perfect! An underpass toward the church I knew was in the area went by in a blur as I hurried to the rest-stop. It was your typical traveler’s stop with bathrooms and picnic tables with a view of the lake. I caused quite a stir among the dozen or so people there. The little hot-dog/ice cream stand was closed, but the primary reason I’d hurried to it was available. I also took the opportunity to put the socks on Loke as it had dried enough before relaxing to admire the view while nibbling on a cold pop tart. I returned the greeting called out by a couple on bikes who arrived from the north. They had little pannier bags so I guessed they were on a day trip. They complimented Loke as they coasted by toward a picnic table. Dusting the last crumbs from my hands and ignoring Loke’s pleading looks for a bite of forbidden carbohydrates, I moved us back toward the underpass. It was little more than a gravel path through a huge tin tube. Felt a bit like passing through a ditch’s storm drain. Predictably, leaving the cycle path meant another hill with a grade around 7% or greater. The effort was not aided by the condition of the road. It was patch work of gravel and deteriorating asphalt. Given the decent size and quality of the houses along it, quite shocking really. The church was closer than I thought. I could see it as I reached the end of the dilapidated little street. A hum-drum Neoclassical appearance and absolutely no information to be found on its history. My search only turned up a church of the same name on the island of Gotland and another much further south in the area of Linköping. Given the other churches I’ve seen in the area, I’m guessing its built on the remains of a medieval church, possibly wooden, and the current structure dates to sometime in the 1600’s. Renovations around the 1800’s perhaps. I could be wildly off the mark. The route through Råda I’d mapped was pretty complicated as I’d thought it would be a longer double back to return to the cycle path. Since it was well under a half mile to return to the Klarälvsbanan and I loved the trail so much, I ignored my map and went back. As I coasted down the ramp from the rest stop, Loke lost a sock. Fortunately, I saw it fly off rather than seeing it missing half a mile later. As the day before went to retrieve it. While wrestling it back on his foot, I began to get an idea of how busy the Klarälvsbanan was. In the 5 min or less it took me to secure the velcro around Loke’s leg, I was passed by a man on a mountain bike heading south, three other cyclists going north and even a man on roller skis! I didn’t mind the traffic. I loved it! Sometimes when I ride, it feels like I’m the only non-road bike (aka wanna-be Tour de France-er) cyclist using the paths and routes outside and between towns. This one was obviously very popular. It felt a little odd reading that. I know Sweden is a northern country, but since we were only in the middle of it, it hardly seemed we should be on the same latitude as the places listed. Things like refocus my perspective which is a good thing. This collection of signs also introduced me to green spots along the trail. Certain places were marked with signs denoting ‘nature objects’ along the Klarälvsbanan in 2007. They’re unique places showing specific birds, insects and flowers living in the immediate environment. When I’d begun mapping the route, I half expected to endure some tedium. In the past, long straight roads have bored Loke and I both. Even when they’ve been flanked by woods with little hills making us go up and down, I’ve found myself wishing desperately for a curve or a turn at a junction to give some interest. No such problem with the Klarälvsbanan for either of us. The woods, flowers, small streams and lake views kept me smiling even over the most arrow straight parts. Though Loke had gone strong and faster than usual the day before on our longest ride of 2012, he continued to run just as well or even better as we crossed mile 10 of this ride. He wanted to lope every chance he had. He seemed impatient every time I stopped him for water, taking only a couple laps as if to appease me so we could move on. He was doing what he had been born to do and he was as happy as a husky could be. The condition of the cycle path supported his enthusiasm. There were hills and some of them were quite long, but as expected, the grades were very gentle (3%) with few exceptions. In some places there were the winter cracks filled with lumps of tar or dips where it had subsided. Occasionally even odd, sudden bumps the size of watermelons painted bright yellow for high visibility. But sections like that were few and short. Where the cycle track crossed even the meanest dirt road, it had been paved for 10 meters to either side guaranteeing a smooth passage. No wonder people use it for roller skis! After mile 13 or so, I wanted Loke to go a little slower so maybe he could go farther. It resulted in him pulling harder. It’s difficult to know which is more likely to tire him. Running 8.5+ mph or dragging against the brake at 7.5 mph. The sun began to play peek-a-boo with the ground as the clouds thinned. I felt a little warmer and Loke panted heavier, but he still continued the brisk trot with dogged (haha) resistance to my attempts at a more moderate pace or stops for water and sock checks. The endurance of the socks proved an even bigger surprise than Loke’s tirelessness. I’m accustomed to adding a new layer of tape every 3-5 miles depending on the condition of the surfaces. Maybe it was the smooth nature of the road bed, but even after 10 miles it was original tape with surface scuffing. The traffic along the cycle path continued steadily. Cyclists wearing racing jerseys on road bikes. People on touring bikes with panniers and baskets for single day or multiple day rides. More people on roller skis than I’ve seen in the previous seven years. Even a few pedestrians. One woman strolling along had a huge and very unusual German Shepherd. Instead of the usual black and tan, white or black coat, he was more like a tortoise-shell cat. Mostly black with random streaks, spots and patches of orange, brown with tiny bits of white thrown in. Quite striking. At times the path ran right up against unpaved roads, close enough I was surprised those who had laid out the route hadn’t simply used the available road, saving the time, cost and effort of paving the old rail bed. I suppose they wanted a truly ‘car free’ trail. I can’t object to that in the least! Car-free wasn’t the only convenience afforded the Klarälvsbanan users. Signs would indicate which crossing roads had points of cultural interest, B&Bs and cafes even if they didn’t mention how far away. Every 5 – 10 km, you’d find a blue outhouse, always odor-free. Picnic tables for a nice rest stop, sometimes with enough space to pitch a tent. Such amenities were often well away from roads, so obviously they had been built specifically for the cycle path. Shortly after passing the German Shepherd, we came to a house about 75 yards from the path. A pack of dogs went absolutely nuts, gated in on the porch of the house. I eyed it a bit warily, concerned one particularly large dog might leap the flimsy gate. Once I was convinced it would hold, I saw them. Three beautiful draft horses. A white and two bays who wore fly covers. I love horses, but I often find myself most enchanted by the cold-bloods. The size of them and the heavy-boned build combined with that unflappable calm. There’s just something so enduring and peaceful about them. These were no exception. No fear in them, only quiet curiosity as they ambled over. Even walking in an unhurried gate, their hooves thudded like drums. I sat smiling and talking to them for a few minutes as they softly blew and nickered at us. We entered a more populated area once leaving the horses. As my Garmin showed 22 miles, making this ride longest of the year, thoughts turned toward ending the ride soon. Though my furball seemed unstoppable, two days running of over 20 miles both times was enough. If we’d been getting 20+ mile runs in every week, I would have been willing to go on. The way became a little busier through the fringes of the larger town of Munkfors as the locals used it to get around. Other bike riders called out cheery hellos as I passed. One young man stopped his scooter, turning it off as I passed. Perhaps he was worried it might frighten Loke if he sputtered by so close. I found an indicator of the cycle path’s history as a rail road. Loke pulled me briskly past the distinctive building and low stone platform before I recognized it for an old train station. 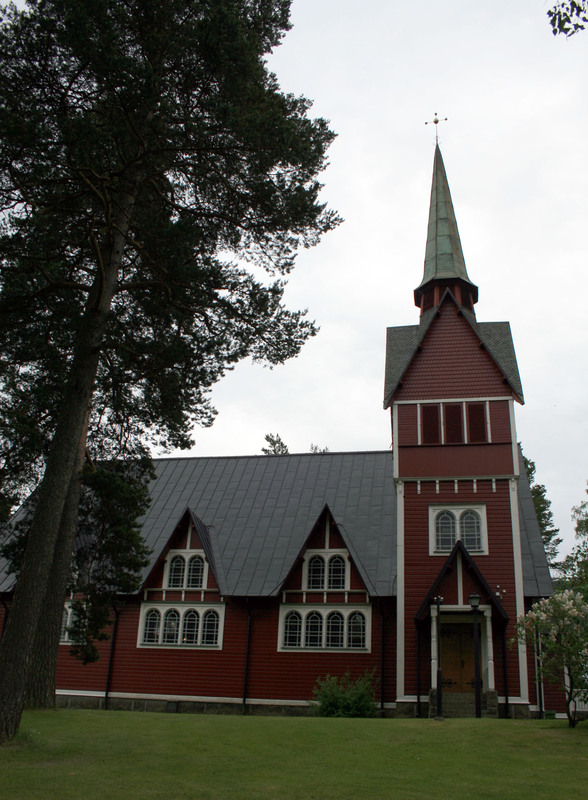 Entering deeper into Munkfors, I started looking for the church. It was nearing 2 pm when Jens would leave his fishing spot to return to cell coverage to check on me. Expecting difficulties to reach the church, I thought perhaps to get a distant shot of it as I passed and then a close up after Jens picked me up. Instead, it was far simpler to get there from the Klarälvsbanan than anticipated. A short climb up a not-terribly steep hill (4-5% grade) and left turn directly into the parking lot. A bit sign forbade bikes and dogs in the church yard, but a light post near a huge, shady tree surrounded by thick, short cut lawn offered something close to luxury for Loke. I settled him with his water dish, told him I’d be right back. He watched me walk into the church yard without touching his water. His eyes opened and head lifted as I sat down in the trike, making sure I wasn’t going anywhere. Then he wiggled onto his back and stretched before flopping onto his other side, content to doze. Any indecision I might have entertained would have ended at the sight of the flattened furry one. I roused him long enough to remove harness and socks. Not to fear. He wasn’t broken. The hour nap waiting for Jens followed by another 45 minutes in the car back to the cabin and Loke’s perkiness returned. It wasn’t bounce-off-the-walls high energy, but you wouldn’t have known he’d run over 45 miles in two days. Jens even teased me about hitchhiking my way to Munkfors as Loke pestered us. It only got worse once we started grilling. He got a nice piece of pork with a big helping of kibble. That made him as happy as running did. I didn’t eat nearly enough to cover the calories I burned, but I was tired enough to not care. It was another early night.